Gold advanced Tuesday, snapping a two-session losing streak. 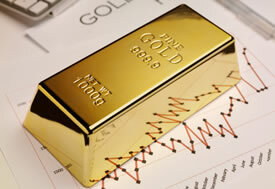 The yellow metal was supported by a weaker U.S. dollar and U.S. inflation data that was read bullishly. Gold prices for December delivery settled up $8.70, or 0.5%, to $1,746.30 an ounce on the Comex in New York. Gold traded between $1,736.10 and $1,748.90. "From an inflation standpoint, the fact that the CPI is in line gives the Fed more room to continue easing," Reuters quoted Adam Sarhan, CEO of Sarhan Capital. Today, the monthly Consumer Price Index (CPI) report from the U.S. Labor Department showed that inflation in September rose 0.6% for a second month. Core inflation, which excludes energy and food prices, advanced 2% over the past 12 months — right at the Federal Reserve’s target area. Although gold has traditionally been purchased as a hedge against inflation, it has more recently gained as a result of Fed stimulus measures and data that supports continued easing. Silver for December delivery gained 21.6 cents, or 0.7%, to $32.959 an ounce. Prices ranged from $32.655 to $33.080. Platinum for January delivery closed at $1,645.20 an ounce, rising $12.90 or 0.8%. The precious metal traded between $1,635.00 and $1,652.70. Palladium for December added $6.35, or 1.0%, to $638.95 an ounce, ranging from $631.50 to $642.40. Until today, October gains in U.S. bullion coins had atypically occurred only later in the week. Demand jumped Tuesday as U.S. Mint distributors ordered 16,000 ounces of gold coins and 420,000 ounces of silver coins. Both increases were significantly better than sales through all of last week when 11,500 ounces of gold coins were sold and 177,500 ounces of silver coins moved. The following table provides the most recent daily, October and year-to-date bullion sales figures as provided by the U.S. Mint.